Photograph, Purported image of Jacob Brodbeck's plane; the validity of the image has been questioned. Image available on the Internet and included in accordance with Title 17 U.S.C. Section 107. AVIATION. The first people in Texas to fly, in the 1860s, were air-show balloonists and their passengers, although several inventors were also busy with plans for winged flying machines. The alleged flight of Jacob F. Brodbeck in 1865 has become a Texas legend. After the Wright brothers' controlled airplane flights in 1903, aeronautical progress generally was slow until 1909–10, when European aviation made rapid strides and the United States government acquired its first aircraft. Aerial demonstrations proliferated at sites across America, including Houston, where a Frenchman, Louis Paulhan, made the first airplane flight in the state on February 18, 1910. Flights in other Texas cities soon followed, and some Texans began building their own airplanes. Records of many of these projects are often imprecise, but one of the earliest Texans to fly appears to have been L. L. Walker, of Houston. He apparently flew his aircraft, a Bleriot monoplane, during October and November 1910. Several airplanes and fliers were active around the state before World War I, and at least two women, Marjorie and Katherine Stinson, of San Antonio, became well-known pilots. Photograph, Picture of the First Aero Squadron Texas. Courtesy of Texas City Library. Image available on the Internet and included in accordance with Title 17 U.S.C. Section 107. General Pershing called on the Curtiss Flying Jennies to pursue Pancho Villa across Northern Mexico. Courtesy of Warfare History Network. Image available on the Internet and included in accordance with Title 17 U.S.C. Section 107. Military aviation had already begun to develop in Texas. Lt. Benjamin Foulois, a colorful pioneer pilot, arrived at Fort Sam Houston in February 1910, assembled the army's recently purchased Wright biplane, and took to the air on March 2, 1910. Three years later the newly established First Aero Squadron, with nine airplanes, was assigned to Texas City. After serving in other states, the First Aero returned to Texas in 1916 to support Gen. John J. Pershing in his pursuit of Francisco (Pancho) Villa into Mexico. In 1917 American entry into World War I brought the first of many military flight schools to Texas, where students appreciated the level terrain and year-round flying weather. In addition to Kelly and Brooks fields in San Antonio, facilities throughout the state trained thousands of fliers, mechanics, and other aviation personnel and established a legacy of military aviation. Texans such as Wiley Post, Howard Hughes, and Douglas "Wrong Way" Corrigan posted records and made headlines during the 1930s. These events dramatized the role of aircraft in reducing time and distance and made Texans more inclined to utilize airplanes in a state where distances were vast and centers of population were far removed from each other and from other urban areas of the United States. Photograph, Picture of a National Air Transport plane used for U.S. mail. Courtesy of Aerodacious. Image available on the Internet and included in accordance with Title 17 U.S.C. Section 107. The first commercial line to serve Texas was National Air Transport, one of the private companies incorporated to take advantage of the Air Mail Act of 1925. On May 12, 1926, a National plane left Love Field in Dallas and headed for Chicago with the first air mail; passenger service was added in the fall of 1927. Braniff Airways, a regional carrier started by Thomas Elmer Braniff, made Love Field its principal operations and maintenance base in 1934 and eventually moved its home office from Oklahoma to Love Field, in 1942. Under the guidance of Cyrus R. Smith, of Austin, American Airlines routes through Dallas not only bolstered the area's reputation but also offered Texans rapid transportation to commercial centers on both coasts. Pan American offered international service from Brownsville to Latin America. Photograph, Aerial view of San Antonio, TX, as part of the Tobin Aerial Surveys. Image available on the Internet and included in accordance with Title 17 U.S.C. Section 107. As a major agricultural state, Texas became a lively area of activity for crop dusters. Many operations like rice farming used aerial seeding, fertilizing, and dusting against insects. The rapid growth of surveying for oil leases in the booming Texas oilfields propelled Tobin Aerial Surveys of San Antonio into early prominence in the new industry of aerial photogrammetry. Around the "oil patch," with widely scattered operations and a lack of convenient all-weather roads, planes became standard tools of the trade for both corporations and wildcatters in a business noted for its aggressiveness. Photograph, Picture of women who served in the Women's Airforce Service Pilots in Sweetwater, TX. Courtesy of Bob Bullock Museum. Image available on the Internet and included in accordance with Title 17 U.S.C. Section 107. During World War II geography and climate again made Texas a center for aeronautical training. The base at Corpus Christi became the world's largest naval air-training station; Randolph Field was the army air force's "West Point of the Air." 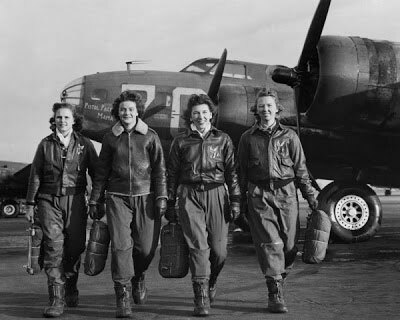 At Avenger Field in Sweetwater, the Air Force carried out training for WASPS, the Women's Airforce Service Pilots, who flew thousands of warplanes from factories to airfields, towed aerial targets, and performed other functions. Some forty military fields in Texas turned out 45,000 pilots, 25,000 bombardiers, and 12,700 navigators. Moreover, the state became a major aircraft manufacturer; new plants employed thousands of workers. During the war years, two companies in Dallas and Fort Worth alone employed some 70,000 men and women who built 50,000 aircraft. Refineries in Texas were principal suppliers for high-octane gasoline used by Allied aircraft in every combat theater of the world. In the postwar years, the general aviation sector (agricultural, business, and personal flying) rapidly developed throughout the state. As Texas industry grew, many businesses saw the need for rapid air travel to distant business centers from coast to coast. Scheduled air transport did not always offer convenient and timely schedules; for these reasons, business and corporate flying rapidly increased. In agriculture the long growing season and broad fields favored the development of such specialized agricultural aircraft as the trend-setting AG-1 at Texas A&M University, and Texas became a world leader in the design and production of such airplanes. Along the Gulf Coast, dozens of helicopters made their runs to offshore oil rigs, carrying relief crews, mail, groceries, repair parts, and myriad other cargos. In sprawling cities, especially in rush hours when accidents frequently occurred, the versatility of helicopters as ambulances was invaluable. Photograph, Aerial view of the Houston Intercontinental in the '70's. Image available on the Internet and included in accordance with Title 17 U.S.C. Section 107. However, it was the growth of scheduled air travel that necessitated new urban airports. Houston Intercontinental opened in 1969; Dallas-Fort Worth Regional Airport opened in 1974. The convenience of air travel attracted much new business to the state. The airlines serving Dallas-Fort Worth, Houston, and other major cities reflected the revolution in aeronautics since 1945. Piston-engined transports gave way to jets in the 1960s, including long-range jumbo jets capable of nonstop flights to Europe from both DFW and Houston. In times past, when a European visit required at least two or three weeks of sailing on ocean liners, only the very wealthy could afford such luxuries of time and expense. The jets, with rapid travel and lower fares, brought a democratization of foreign and domestic travel. Photograph, Picture of the Randolph Air Force Base in San Antonio, TX. Image available on the Internet and included in accordance with Title 17 U.S.C. Section 107. In the mid-1980s Texas listed some 60,000 licensed pilots and 25,000 registered aircraft. There were 250 airline aircraft based in Texas, and fifty-five different airline companies served the state. But these numbers represented only a small part of the aerospace industry in Texas. Numerous military air bases annually pumped billions of dollars into the state's economy. The United States Air Force Air Training Command, headquartered at Randolph Air Force Base in San Antonio, trained more Air Force pilots than any other facility. The Naval Air Station at Corpus Christi was the second largest naval aviation center in the free world. After 1945 the Dallas-Fort Worth area, a major military complex, turned out bombers, fighters, and helicopters, as well as missile components and advanced electronics. Because these products played such a significant role in world affairs, such as the multinational production and sales agreements for the General Dynamics F-16 fighter, the aerospace industry helped keep Texans attuned to international economics and politics. E. C. Barksdale, The Genesis of the Aviation Industry in North Texas (Austin: University of Texas Bureau of Business Research, 1958). Roger Bilstein and Jay Miller, Aviation in Texas (Austin: Texas Monthly Press, 1985). Handbook of Texas Online, Roger Bilstein, "AVIATION," accessed April 24, 2019, http://www.tshaonline.org/handbook/online/articles/epa02. Uploaded on June 9, 2010. Modified on August 3, 2017. Published by the Texas State Historical Association.